PelGar produces a small range of plant and crop protection products based on natural pyrethrum. The range is specifically designed for use in organic farming systems and for use where a short withdrawal period is required, i.e. crops need to be treated 24 hours prior to harvest. 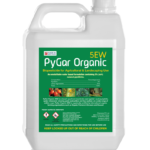 PBO free, PyGar Organic is approved for organic farming against a wide range of pests on all soft fruit, top fruit, vegetable crops, salad crops and ornamentals.